After having one of the greatest meals in 2011 at Icehouse, we got a chance to try its sister restaurant Kitchenette earlier this month. A little off the beaten path, the place is located on the outer edges of the Village on the corner of Rene Levesque and Panet. There is a distinct vibe that lends itself to the space – an open kitchen is prominently featured, being visible from almost all angles of the restaurant. The mix of antique decor – leather banquettes, old wooden floors and weathered barstools – with the modern facilities of the kitchen meshes incredibly well to create an intimate yet contemporary atmosphere that is unlike any other. 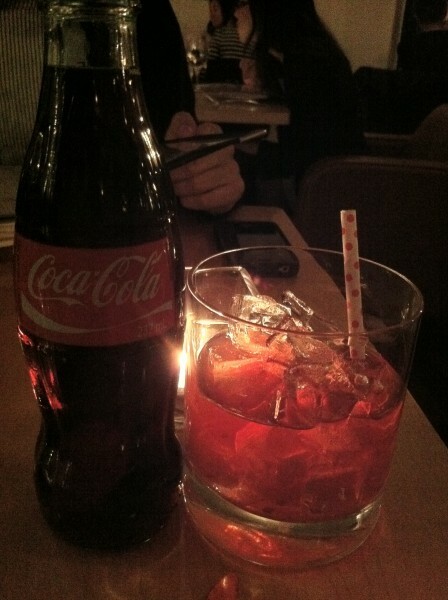 Starting off our evening with a couple of drinks, I had the pickled cherry coke cocktail that came complete with the coke in the glass bottle and a house pickled cherry on top. Decorated with little red and pink polka dots, the straw that came with it was a nice touch. Even the material was interesting – something like a cross between paper and plastic. It was soft to the touch, but didn’t quite melt while submerged in liquid for a prolonged period of time. We also had a pint of Creemore Springs which is always good. A spiked lemonade was ordered later on in in the meal – definitely a stronger, more punchy cocktail if you’re looking to get a bit more buzzed. The albacore and calamari ceviche came with sweet potatoes, pickled rhubarb, beer nuts, coriander and lime. The pairing of fresh fish and the citrusy flavor with the fried chips was fantastic – so delicious that my only complaint would be that there wasn’t enough of it. 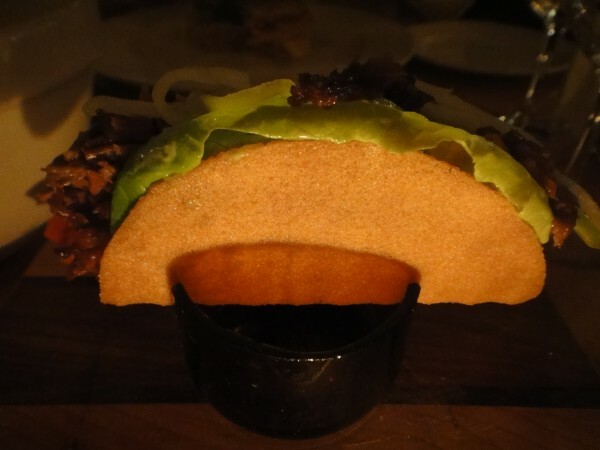 The Japanese taco with pulled beef teriyake, green goddess and daikon-jalepeno slaw was equally delicious. Coming in a sweet little holder of its own (perhaps diverted from its original purpose of ashtray? Kudos for creativity here.) our plates were spotlessly clean within seconds. Seriously. Moving on to the mains, anticipating the exciting flavors to come, we had the beer braised short ribs with house BBQ sauce, roasted garlic and mashed potatoes. This was definitely a heavier dish that took unregrettably took up any leftover room in our stomachs, filling us up in the best imaginable way possible. Super juicy and super thick, the meat had been done sous-vide style to achieve the oh-so-tender, perfectly done texture. 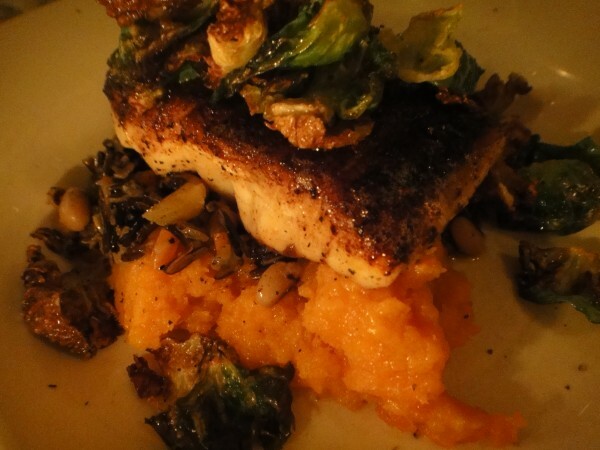 The blackened halibut with sweet potato puree with toasted marshmallow, hoppin’ John and fried brussel sprouts was a medley of deliciousness. Not much else to say there except for … amazing. 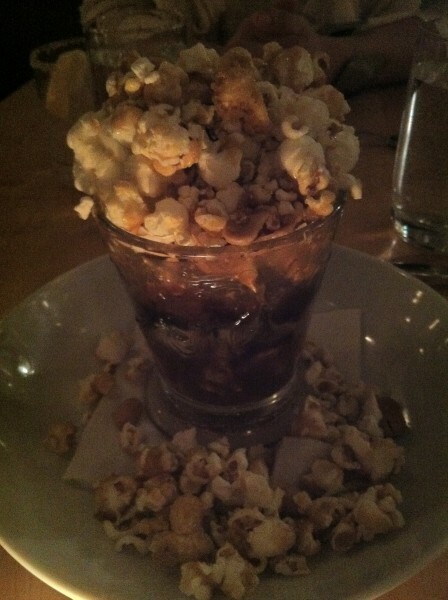 Finishing off with some sweet stuff, we had the unique sticky toffee pudding sundae with cracker jacks. Who would have thought? And yes, it was mouthful upon mouthful of heavenly goodness. This has got to be one of my favourite desserts of the year so far. It’s got a great visual aesthetic too, with the molasses and peanut coated popcorn overflowing from the top and spilling over onto the plate underneath. Yum, yum, yum. The other was a bread pudding with Jack Daniels and pecans. Moist and mouthwateringly sweet, this dessert was the perfect balance between crunchy, sticky and sweet. Could not have asked for much more out of this evening. Perfect food, perfect service and perfect company. Tags: Albacore, Braised, Calamari, Ceviche, Citrus, Cocktail, Coke, Cracker Jack, Creemore Springs, forkandtell, Garlic, Halibut, Hoppin John, Japanese, Kitchenette, Marshmallow, Mashed Potatoes, Montreal, NIck Hodge, Pickled Cherry, Popcorn, Rene Levesque, Short Ribs, Southern, Taco.